The Prime Minister, Shri Narendra Modi addressing the Indian Workers at a project site, in Mesheireb, Downtown, Doha on June 04, 2016. Prime Minister Narendra Modi on Saturday told Indian workers in Qatar that the monsoon this year will be good for India. "Maybe none of you know me. 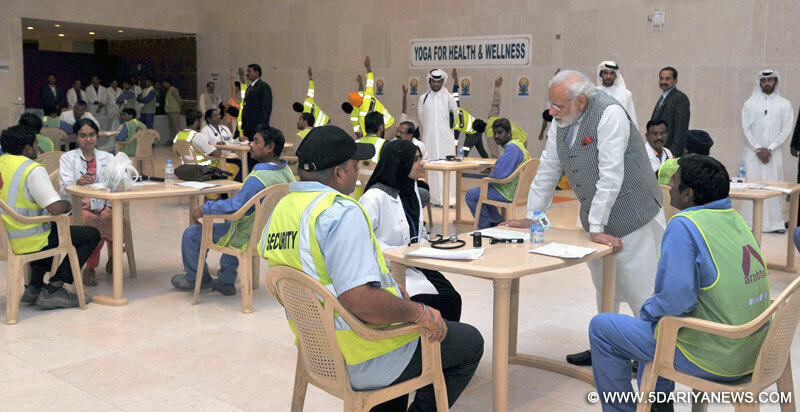 But you must be feeling good that somebody has come from India to meet you," said a smiling Modi as he addressed a gathering of workers dressed in bright yellow uniforms at a free medical camp organised by the Indian Community Benevolent Fund (ICBF) and the Indian Doctors Community (IDC) in this Gulf nation. "I have good news for you. This year the monsoon will be good in India," he said.Modi's visit - in the second leg of his five nation tour after Afghanistan - is the first to Qatar by an Indian Prime Minister since Manmohan Singh in 2008.Of the around 630,000 expatriate Indians in Qatar, many are blue collar workers.Modi will be hosted for dinner by Qatari Prime Minister Abdullah Bin Nasser Bin Khalifa Al Thani on Saturday evening.On Sunday, he will begin his engagements in Qatar with a meeting with business leaders following which he will hold a restricted meeting with Emir Tamim Bin Hamad Al Thani.After Qatar, Modi will go to Switzerland, the US and Mexico.